your banner or other material such as fliers in our events. a member of their staff is bereaved. you can refer your staff to us, to receive free Bereavement and Grief Sessions. You can also fill our online Alliance Application Form (under construction). The Near North Palliative Care Network has been searching for a method to engage the community in a dialogue about death and the needs of the dying. Often there is a misconception that hospice palliative care is a focus on death. We want to turn that idea upside down. We want our communities to understand that quality of life and living a good life also includes a discussion about end of life. We support the view that we have a finite life that we need make the most of. Hospice palliative care is not so much a method but a philosophy of care. We are a death-denying society. Death is somehow viewed as unnatural or giving up. Palliative care is about accepting that we have finite lives and living well every hour of every day. It is about relieving suffering and improving the quality of a person’s life and how they die given a life limiting illness. It is about promoting opportunities for meaningful and valuable experiences, personal and spiritual growth. It is an approach that improves quality of life of patients and their families. Only 16% to 30 % of Canadians currently at the end of their life have access to or receive hospice palliative and end-of-life care services (Canadian Hospice Palliative Care Association, 2013). When asked, most people have indicated that they would prefer to die at home in the presence of their loved ones (Canadian Institute for Health Information CIHI, 2007). Yet almost 70% of Canadians die in a hospital setting. A 2002 study showed that 70% of family caregivers acknowledge that providing care to a loved one is stressful, and that they require time away from the responsibility of caring for a loved one (National Profile of Family Caregivers in Canada – 2002: Final Report). In 2007, 23% of Canadians said that they had cared for a family member or close friend with a serious health problem in the last 12 months, using personal savings to survive (41%), and missing one or more month of work (22%) (Fact Sheet: The Role of Family and Informal Caregivers). Ignoring end of life discussions is at our peril as families and communities. 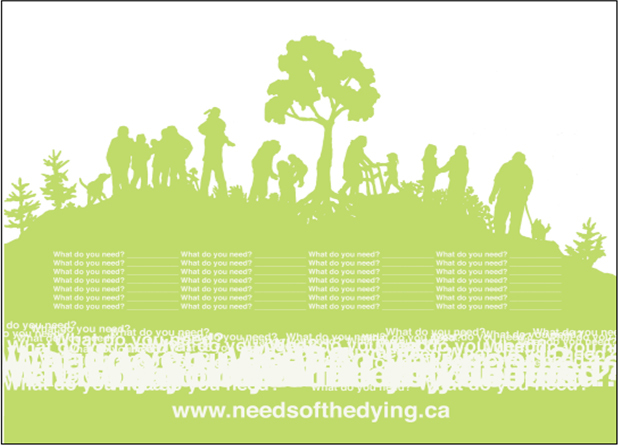 The needsofthedying.ca campaign was developed in partnership with local artists and members from Nipissing University. The idea is based off of a community art project developed by Candy Chang called the “before I die” campaign that has since gone global in its reach (http://beforeidie.cc/). An outline of the project has been communicated to the North East Local Health Integration Network (NE LHIN), our main decision making and payment agency for the province of Ontario. 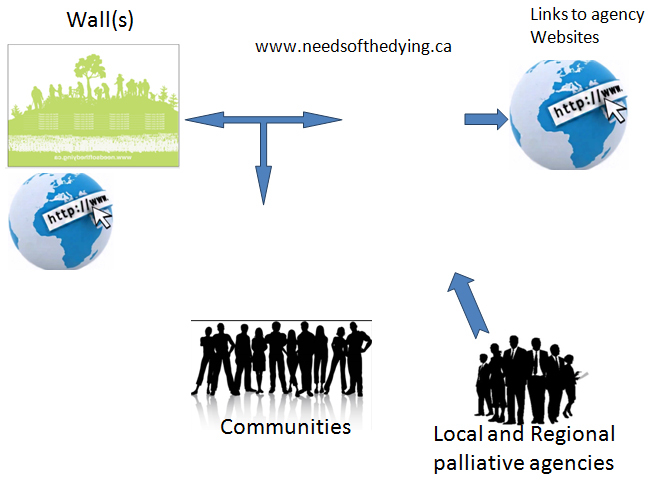 The NE LHIN has already contributed video interviews for the needsofthedying.ca website and expressed interest in adopting this project at a regional and provincial level once the local project has been established.